Now that you're done building brightly colored worlds, maybe it's time to construct something truly practical from those buckets of unused Legos. Thought you were too old for toys? Think again. Adults have ample reason to revisit Legos, if not for sheer amusement, then to adapt these childhood classics for practical uses at home. Either pursue your own vision or, if inspiration fails, follow one of the examples below. As you will see, creative minds have already pieced together numerous ways to repurpose Legos in projects that are as functional as they are eye-catching. So if you’ve been saving a bucket of these building blocks for your grandkids, why not break them out sooner rather than later? It won’t cost you a dime to do, and the result might prove invaluable. 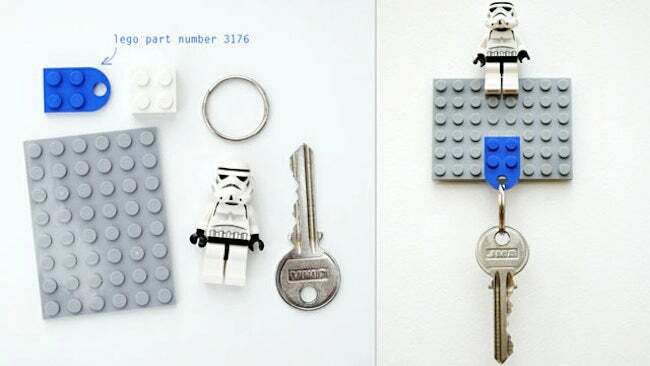 Repurpose Legos to make a key organizer so that you’ll never again be blocked out of the house—get it? Start by fixing a small Lego base plate to a convenient spot on the wall. Then either poke a hole into a regular Lego block using a bradawl or find a piece with a built-in opening through which your key ring can slide. Want to be able to distinguish your USB flash drive from all the others? Here’s how: With a hobby knife, hollow out a 2×4-dot Lego brick. (To accomplish this, neatly cut off the protruding “tubes” inside the brick.) Cut a notch in the brick to accommodate the USB connector. 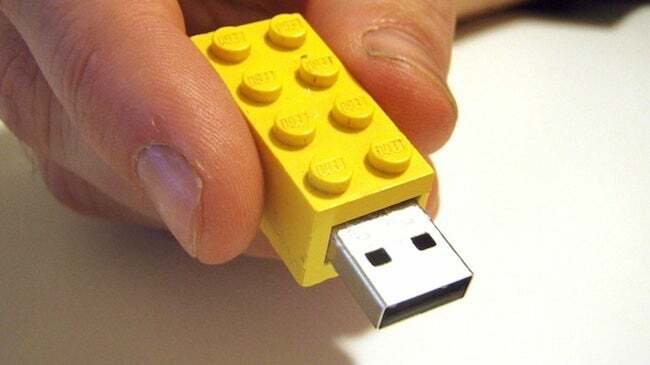 Take the housing off your thumb drive, fit the “naked” drive into the Lego, then use glue to attach a flat 2×4 brick to the back of the hollowed-out brick to close up the drive. Like that almost-finished Lego set that’s missing just one piece, a home office is incomplete without a tape dispenser. Sure, there’s no reason you can’t buy one of these simple contraptions from Staples, but isn’t it much more fun to make your own? 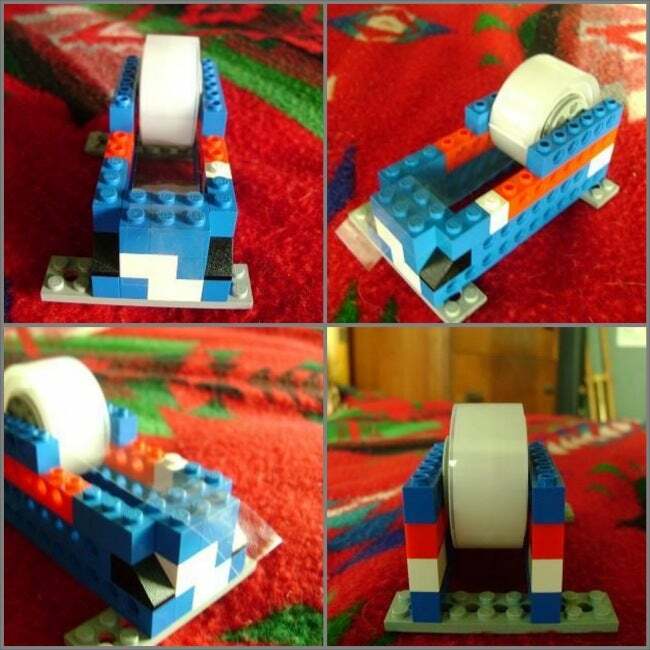 Use a strategically placed brick as the tear-off edge and a Lego wheel as the spool. 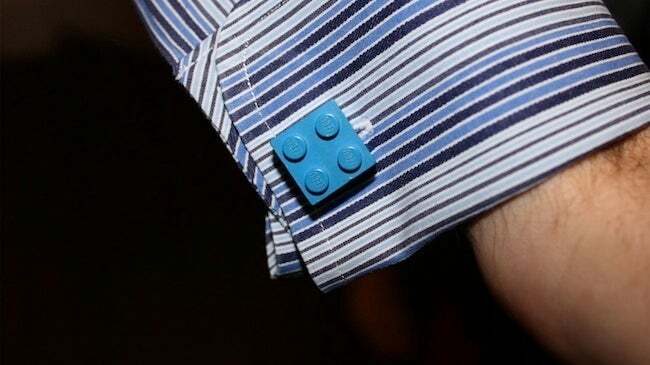 Accent your formal attire with a bohemian touch: Lego cufflinks. They’re super easy to make, but first you’ll need to either track down some cufflink backs at your local craft store or be willing to sacrifice an old pair of cufflinks so you can reuse the backs. Then you just need to collect two shallow Lego bricks in the color of your choice and connect the cufflink backs to the Legos with a strong adhesive. 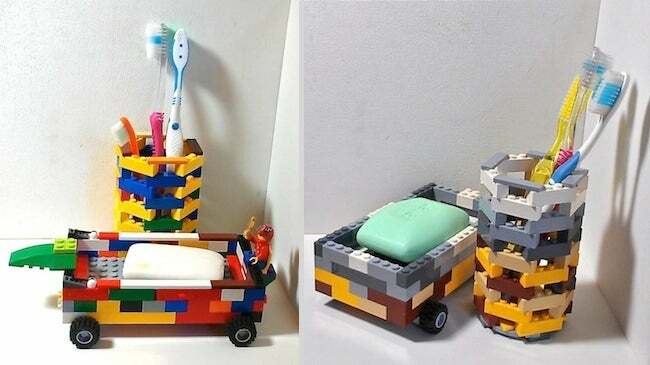 Repurpose Legos to build a container for your toothbrush, which not only safeguards it against the force of gravity, but also keeps its bristles away from the soapy, wet sink. Customize the design however you like, choosing a shape, size, and color palette to match your grooming needs and personal style sense.